Biological science aide Anne Berry puts wheat in the hopper of a color-image sorter. 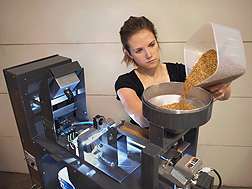 The ARS-developed camera behind her takes and processes a color image of each kernel as it falls off the end of the chute. The kernels are then sorted based on visual features and deposited into either of two separate buckets at the base of the sorter. Credit: Thomas Pearson. Fast, portable, and comparatively inexpensive, an improved seed-sorting machine developed by aU.S. Department of Agriculture (USDA) scientist and an industry colleague is helping plant breeders and others separate the seeds they want from those they don't, with an impressive degree of accuracy. That's not all. In tests in his laboratory at the ARSCenter for Grain and Animal Health Research in Manhattan, Kan., Pearson showed that the sorter can help wheat breeders by differentiating kernels of hard red wheat from kernels of hard white winter wheat, with 98.6 percent accuracy. Pearson has documented his work in peer-reviewed articles published in Applied Engineering in Agriculture, Computers and Electronics in Agriculture, and the Journal of Food Measurement and Characterization. His studies are highlighted in the July 2013 issue of Agricultural Researchmagazine. These filthy Government scientists at the USDA need to be fired immediately. Government is pure failure by definition, and we need to keep it that way.